In my travels in India I’ve come across some really amazing halva. It’s more often found at temples as prasadam (a blessed offering) shared for free with guests than at restaurants, but the delicious dessert makes appearances at wedding feasts, birthday parties, dinner banquets, and all kinds of holidays and festivals. One thing I absolutely learned from my Indian friends is that any day is a reason to celebrate if you put passion into your cooking and share the joy. Yeah, remember that when you’re scrubbing all those pots and pans after the feast. serves 4 / time: 30 min. Bring 1 1/2 cups water to boil in a small pot. Add cardamon, ginger, cloves, nutmeg, cinnamon, saffron, and zest to the boiling water and boil on low for 7 min. Heat a large sauce pan on medium low with margarine or oil and slowly add semolina. Mix thoroughly and turn with a spatula or wooden spoon, toast lightly, stirring constantly for 7-10 minutes until grains absorb oil and turn golden brown. While stirring the grains, pour spice water slowly through a strainer into the saucepan with semolina mixture. Reduce heat to low and add 1/2 cup of sugar, raisins, and cashews. Mix well. Stir constantly, cook uncovered until all liquid is absorbed and the texture becomes fluffy, about 7-10 min. Turn off heat and cover for 5 min before serving. Berry Halva: Use 1/2 cup fresh or frozen (thawed!) blueberries, raspberries, or sliced strawberries, or dried cranberries instead of raisins. Berries lend the halva a wonderful color and fruity taste. For these variations the saffron and zest can be omitted. Carrot Halva: add 1/4 cup grated carrot and 1/4 cup walnut pieces instead of raisins and cashews. The Krishnas make all kinds of variations including carob chip and peanut butter. Go wild, have fun, and be sure to share! * Coconut oil is a great choice for the flavor. 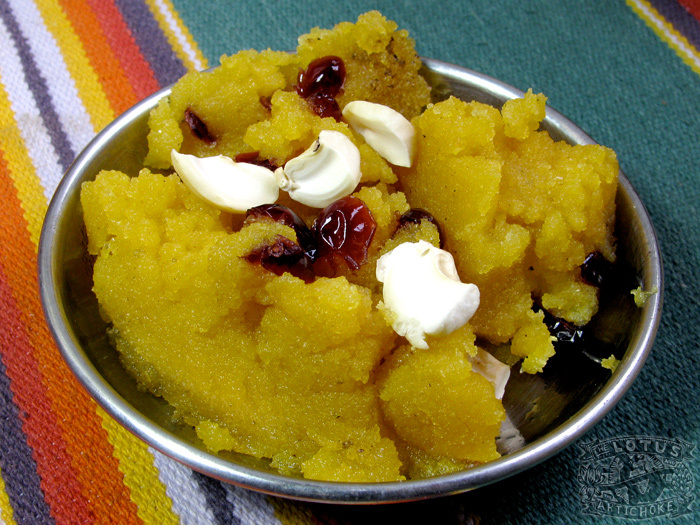 This entry was posted in Indian, Sweets and tagged desserts, halva, Indian sweets, recipe, saffron, vegan. Bookmark the permalink. This looks delicious. Will have to try! Thanks for the recipe. YUM! I’ve actually never had halva, but I’m not sure why. Need to try this! If you try the Halva, please let me know. It’s actually really easy to make and super fun and tasty! Oh, halvah! My favorite is with caramelized sugar and strawberries :-). I find coconut oil the best for a vegan version. It gives a nice flavour, too. I make a version of this using pineapple juice as the liquid. It’s delish. Still with the cashews, golden raisins, and saffron. I haven’t made it in ages and have a big bag of semolina in the pantry. Must make again! Your blog is awesome. Hi Kate! I’m glad you like the blog. That’s cool you’ve made halva with saffron — I love it that way, but others don’t seem to use it often. Pineapple juice — good idea! And Yes, get out the bag of semolina from the pantry!